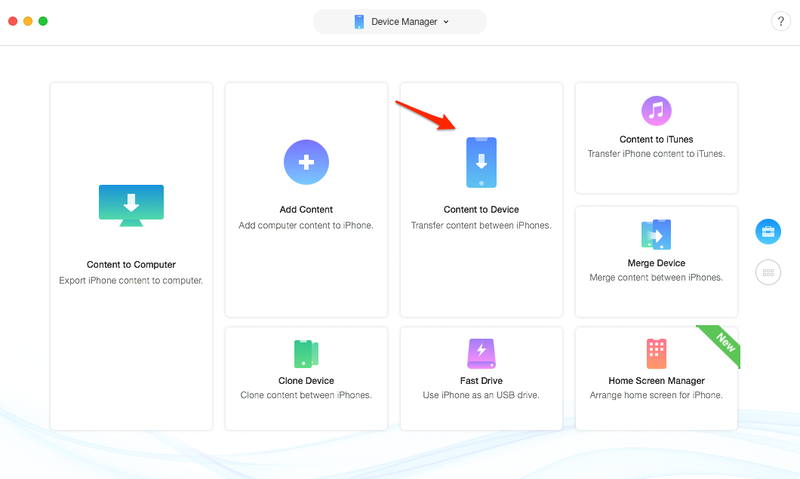 Want to transfer photos from iPhone to iPad but do not know how? 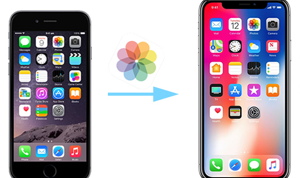 This guide will tell you 4 methods about how to transfer photos from iPhone to iPad, supports iPhone X/XS/XS Max/XR8/7/SE/6s, iPhone 6/5s/5/4s and iPad Pro/Air/mini. I have an iPhone X and I love taking photos. Now there’s a problem, the photos have taken over half of storage space of my iPhone. I just want to move these photos to my iPad. How do I transfer photos from iPhone to iPad? Any ideas? With the advanced built-in iSight camera, the iPhone could be the most ideal alternative to a professional camera, especially the latest X/XS/XR. However, it also takes a lot, even most of iPhone storage space. 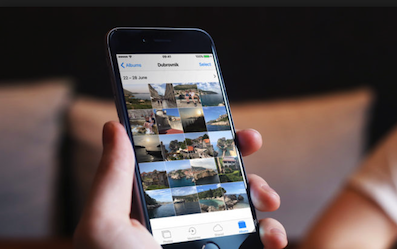 In this case, if you own an iPad, it can be the best solution for you to free up storage space on your iPhone, transferring photos from iPhone to iPad. So here comes the question: How to transfer photos from iPhone to iPad/Pro/mini, especially when you have hundreds of photos to transfer? In this guide, we will work you through 4 methods to complete the job, including the traditional but complicated iTunes, iCloud ways, and a simpler and quicker method. Time-saving & Labor-saving. According to test, it takes only 1 minutes to transfer over 3000 photos. And just 1 click to finish the process. Supports All Kinds of Photos. 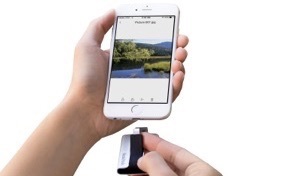 Unlike iTunes/iCloud, it transfers Camera Roll, Photo Stream, Photo Library, Photo Share, Live Photos, etc. HEIC is also supported. Transfer All or Selected Photos. Lets you send all the photos at once, or preview and choose the photos you want to transfer. Guarantees You 100% Security. Different from iTunes/iCloud, data loss would never occur while transferring. 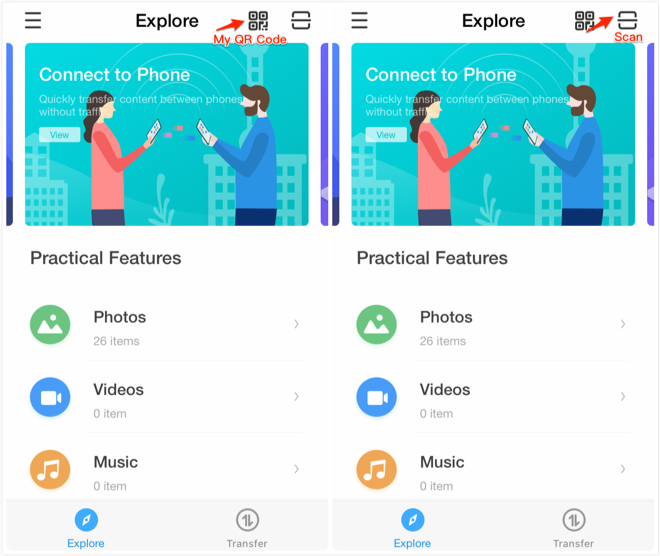 Now, Free Download AnyTrans for iOS on your computer firstly, and then follow the simple steps below to transfer photos from iPhone to iPad selectively or wholy. Step 1. 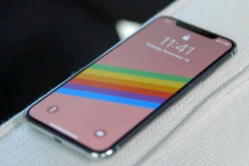 Connect your iPhone and iPad. Launch AnyTrans on your computer > Connect your iPhone and iPad to computer with USB cables > Click button. Step 2. Choose Album to transfer. 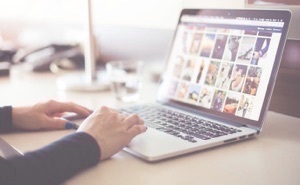 Click Photos > Select the photo album contains the photos you want to transfer. Step 3. Transfer photos from iPhone to iPad. 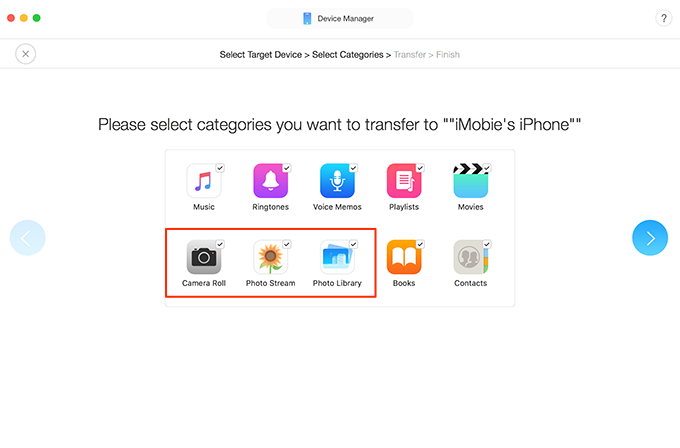 Select the photos you want to transfer > Click To Device button on the upper right corner to transfer selected photos to your iPad. Free Download AnyTrans for iOS on your computer and open it > Plug in your iPhone and iPad to the computer via USB cables > Click Content to Device option. Step 2. Transfer photos from iPhone to iPad. 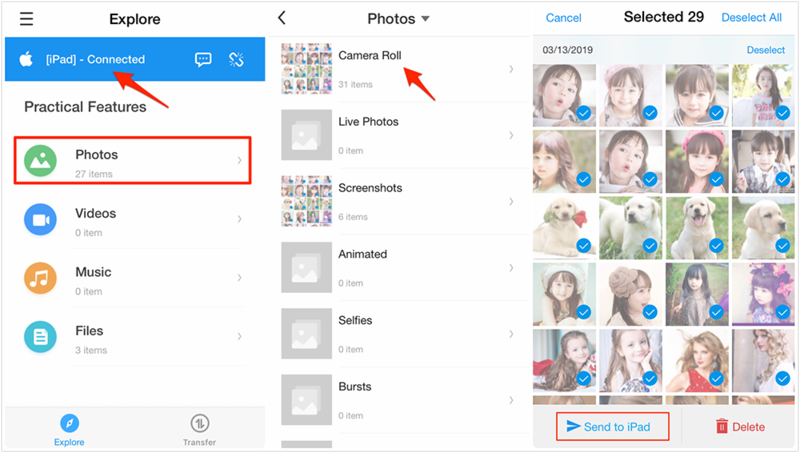 Select the photo albums you need, unselect other file categories > Click Next button to start the transfer all your photos from iPhone to iPad. 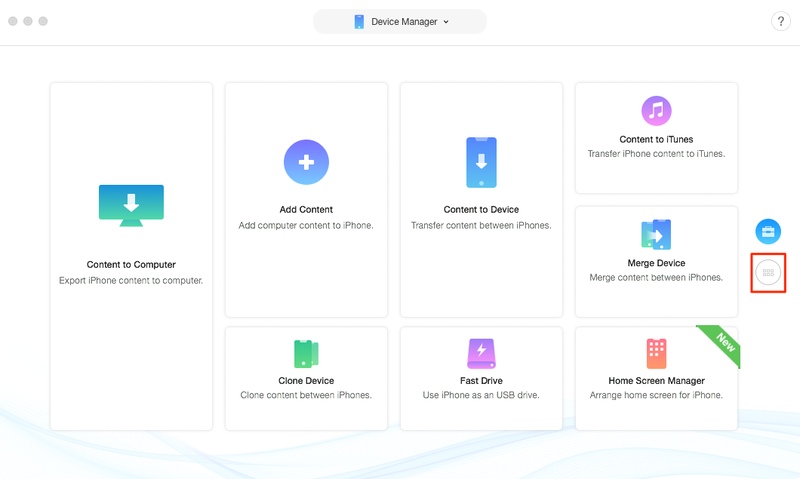 If there is no USB cable available or your iPhone cannot be recognized by your computer, then you can try the AnyTrans app to transfer photos from iPhone to iPad wirelessly. Now connect your iPhone and iPad with the same Wi-Fi and install AnyTrans app on both your iPhone and iPad. You can download it by clicking the below button or directly search AnyTrans on App Store. Step 1 Open AnyTrans on your iPad, tap on My QR code on the top-right corner of your iPad. Step 2 Open AnyTrans on your iPhone, and tap on the Scan button to scan the QR code on your iPad. Step 3 Choose Photos category on your iPhone > Choose the album contains the photos you want to transfer to your iPad > Tap on Select button. Step 4 Select the photos you want to transfer > Tap on Send to iPad to transfer selected photos from iPhone to your iPad. 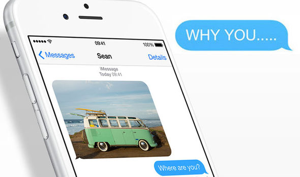 – Besides photos, AnyTrans also lets you transfer videos, music, ringtones, contacts, messages, notes, calendar, etc. – Except for iDevice to iDevice transfer like iPhone to iPad, AnyTrans for iOS also lets you transfer data from iDevice to computer/iTunes and vice versa. 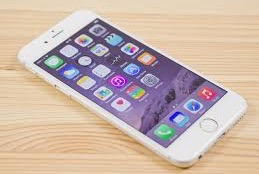 Your iPhone and iPad need to be iOS 8.3 or later. 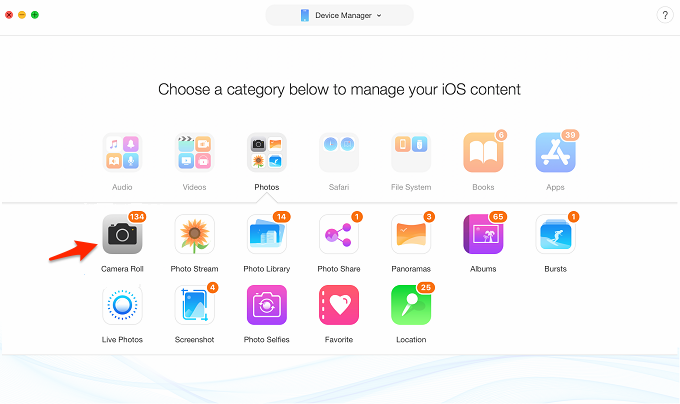 You have to enable iCloud Photo Library on both your iPhone and iPad. Your iPhone and iPad should log into the same Apple ID. Make sure that you have enough iCloud storage space. 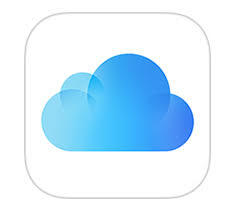 Step 1 Go to Settings > Tap on your Apple ID’s profile part > Click iCloud. Step 2 Tap on Photos > Toggle the “iCloud Photo Library” ON. Wait for the photos on iPhone syncing to your iPad. 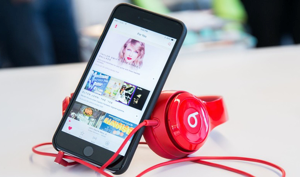 iTunes is also an official way that Apple offers for users to transfer and backup data on iDevices. 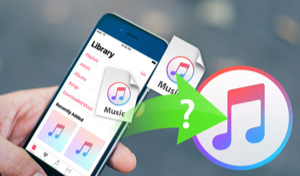 If you have made an encrypted backup of your iPhone using iTunes, then follow the steps here. 1. The iCloud Photos, photos synced from computer, shared photos can’t be transferred with iTunes, you can only transfer photos from Camera Roll. 2. 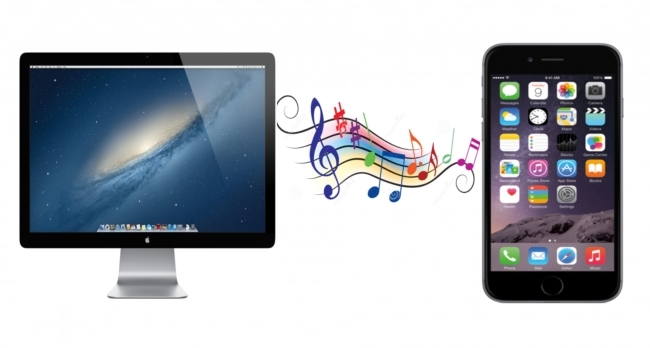 Syncing photos via iTunes will wipe all data on your iPad and replace with the files in the iTunes library. 3. 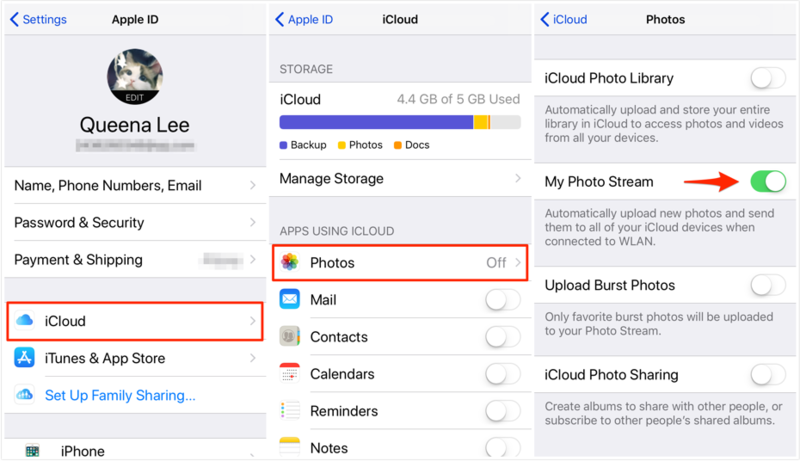 If you turn off iCloud Photo Library on iPhone, iPad, the photos have synced to iCloud but not on your device will be deleted. Step 1 Connect your iPhone and iPad to a computer > Open the iTunes. Make sure that you have the latest version of iTunes. Step 2 Choose your iPhone and click Photos > Select Sync Photos option > Click Apply button to sync your iPhone. Step 3 Unplug your iPhone and plug in your iPad to the computer > Choose your iPad in iTunes and click Photos. Step 4 Check Sync Photos option > Click Apply to sync photos to your iPad (the screenshot takes iPhone for an example). 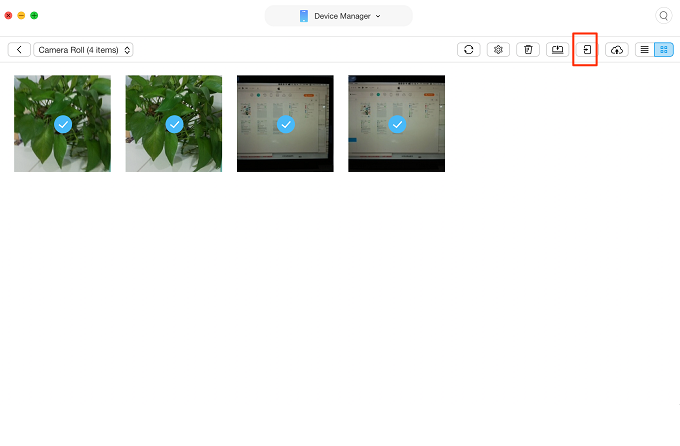 The Photo Stream uploads your photos to iCloud so that they can be accessed from any connected iOS and OS X devices that sign in with the same Apple ID, for iOS 7 and later users (iPhone 5/iPad 4 later). In addition, this way only works when your devices are connected to Wi-Fi. If you are not in good Wi-Fi condition, move to Method 1. Open the Settings app on your iPhone > Tap Sign in to your iPhone > Log in with your Apple ID > Tap “iCloud” > Select “Photos” > Toggle “My Photo Stream” on. Repeat the same process on your iPad. That’s all about how to transfer photos from iPhone to iPad. And no matter you want to transfer all photos or selected ones, AnyTrans for iOS would be the best assistant. Just give it a try by yourself! It can help you always put your lovely pictures in the right place: move photos among iPhone, iPad and computer.